It was high school orientation. I was thirteen, wearing a knee length skirt from Old Navy and a green American Eagle short-sleeved T-shirt. I walked onto the campus of Immaculate Heart knowing no one. The first activity of the day was a name game. As I wandered around the auditorium, introducing myself to strangers – per the game’s rules – I giddily repeated, “Hi, I’m Sienna, and I’m Jewish.” This was, of course, the most interesting fact about me as it pertained to my Catholic school whereabouts. Twenty minutes later, I had encountered the same people – unbeknownst to me – multiple times and had introduced myself as if they were brand new to my repertoire of acquaintances. One such victim subjected to my short-term memory loss was Veronica Wong. Even if I didn’t like her as much as I did, the friendship was practically required. After all, she was the first person my age I’d ever met from my own neighborhood. I guess it turns out I could have shown off my razor scooter to her instead of sharing it with my dad. Within a few weeks of school, I was invited over to the Wong residence. She led me through a door into a tiny room covered in wallpaper and tiny square mirrors. Closing the door behind her, she pressed a button and we slowly ascended upwards. That’s right, her house has an elevator. If our abodes’ close proximity wasn’t enough to seal the deal, the elevator was sure to keep me intrigued for life. After departing what felt like the coolest amusement park ride ever invented, I entered the front hall, where a sink painted to emulate Monet’s lilies a la Veronica Wong would sit on display years later. From there it only got better. We used her button machine to create pins from magazine clippings and drank homemade Passion Fruit Boba (which I would soon become dangerously addicted to). Don’t tell her, but that Bobas the only reason I keep going back. Once January rolled around, I had already become a frequent visitor of the Wong household. I thought it couldn’t get better, but Veronica’s birthday changed everything. When the cake was brought out, there were not the expected 15 candles, but rather a strange configuration of maybe three. This is what the Wongs call “Birthday Math.” Before she could dig in, Veronica had to solve the math equation atop her chocolaty mound of homemade ice cream cake. Over the next few years, the Birthday Math ritual stayed constant, but the eclectic celebratory processes were ever changing. By Senior year though, “Birthday Parties” were no longer all the rage. For Veronica’s 18th, she invited friends over for a low-key evening of dinner and baking. 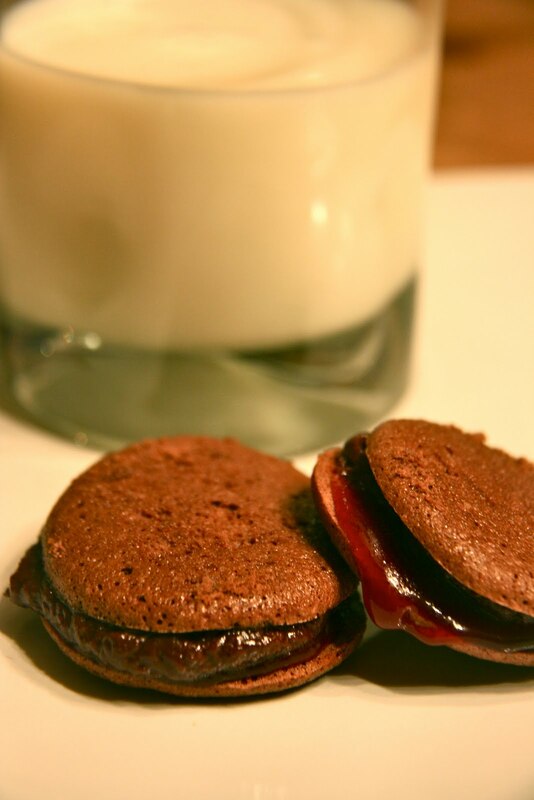 That night, Mrs. Wong taught us how to make Macarons – small French meringue cookie sandwiches filled with chocolate ganache. With the piping bag, we all took turns making “little poops” with the meringue batter atop the parchment papered cookie sheet. Then we all gathered around the oven to watch the small brown mounds form “feet.” (Don’t worry, this will all make sense later). Each of us adorned our cookies with our homemade ganache and chowed down as we discussed our upcoming college careers and presented Veronica with her last set of high school birthday gifts. Whether it’s the small mirrors decorating the elevator, the Monet painted sink in the front hall, solving Birthday Math, watching cookies grow “feet”, or devouring scrumptious bite-sized macarons, it’s clear that at the Wong house, its all about the little things. When Passover rolled around, this concept only became clearer to me. As the resident family baker, I was asked to prepare a Kosher-for-Passover dessert for the Seder. The miniature strawberry shortcakes I prepared the year prior were a hit, but I figured that I might as well mix it up. In case Kosher-for-Passover means nothing to you, the food cannot include any flour or other rising agents. Why? Well, you had to be there for my extra credit Theology presentation for that explanation. I asked Veronica’s mom, René for her recipe, which she happily supplied. Without any doubt, it was the most detail-oriented set of baking directions I’d ever encountered. Though it had me chuckling as I read, the intricacies really helped me along the way. You’ll see. Grandma and I collected the ingredients and spent the day in the kitchen together making a complete mess. She agreed with my sentiment regarding the “little poops” and we had plenty of finger licking laughs. (Am I allowed to refer to poop and finger licking in the same sentence?). The year before, Grandma had taken me to Paris, where we ate cheese and baguettes, drank wine from glass carafes, but somehow missed taking a taste from the overwhelming supply of Macarons in the City of Lights. 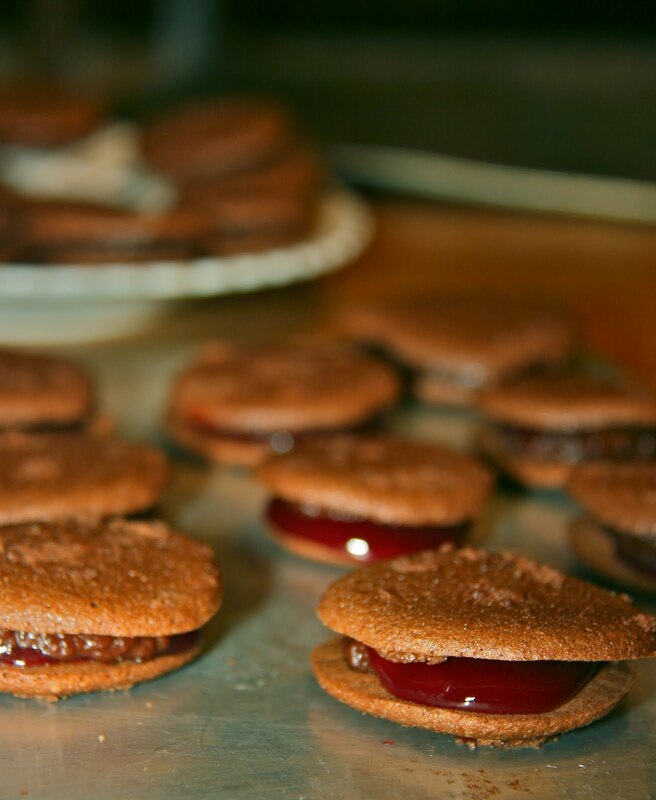 Making them with her was the ganache on the cookie and satisfied our French confection deficit from the year prior. Although I refused to make the trek to Temple, I’m pretty confident that I satisfied the Passover Police with these cookies. They were so well received that not one crumb was left for Elijah. He never shows up anyway. These cookies are difficult to perfect, and even I have yet to do so. But then again chocolate, almonds, sugar, and egg whites can only be so terrible. When crafted correctly, this recipe should yield a delicious batch of chewy sandwich cookies that’ll be sure to satisfy you sweet tooth. So give it a try! Preheat the oven to 375 degrees. If you are using blanched almonds instead of almond meal, pour the nuts into a food processor and blend until they are finely chopped. In that same food processer – or another one if you feel like showing off – blend together the almond meal, powdered sugar and cocoa until well mixed. In a large bowl, mix egg whites and salt on medium speed until fluffy. Increase the mixer speed to high and add in the sugar. Blend for two minutes or until the mixture forms stiff peaks and is firm and shiny. Using a flexible spatula, gently fold in the sugar mixture until completely incorporated. Mix quickly at first and then with slower strokes. Start stirring from the center, widening with larger concentric circles. This is the Wong detail I’m talking about. Birthday Math, anyone? Fill a large Ziploc bag with the batter and cut off about 1 centimeter of one of the corners. On a cookie sheet lined with parchment paper, create one-inch puddles (a.k.a. “little poops”) that are two inches apart from one another. Then tap the baking sheet against the end of a countertop to remove any bubbles from the puddles. Turn the temperature down to 350 and place the cookie in the oven for 10-11 minutes. After about 6 minutes, “feet” should form. This means that the cookies will rise and create what look like a short, wide mushrooms. This will only happen if you let your egg whites dry out before beginning the baking process. Mrs. Wong likes to leave them out for a day, a step that I always forget. My macarons are fairly footless, but still taste like the real deal. After letting the cookies cool for a minute, use a metal spatula to remove them from the paper and transfer to a plate to cool. This recipe should yield about four batches of cookies. Now let’s move on to the ganache. Bring the heavy cream to a boil. A double boiler is preferable, but a regular pot will do fine as well. While the cream is boiling, break up the chocolate into your food processer and mix until finely chopped. In a bowl, work the butter with a rubber spatula until it is soft and creamy. Quickly, pour the cream and chocolate into the butter bowl and mix on high speed until completely incorporated. The ganache should be smooth and glossy. While the ganache is cooling, go back to your cookies and pair the ones that are of equal size. Got one left over? Its okay, you can eat it. I won’t tell. Place the ganache into another Ziploc and cut a tiny whole at one of the corners. On one half of the sandwiches, squeeze slightly less than a tablespoon of ganache in a pile in the center. On the other halves, place tiny dollops of raspberry jam at the center – we’re talking less than a teaspoon. Once all of the cookies are ganache’d and jam’d, lift the ganache side up and carefully place atop its partner. Twisting your fingers as if you can’t decide whether or not to take a sip from your bottled water, press down slightly so that the mixtures spread out. Enjoyed best with Manischewitz. Bon appétit!